Instagram has launched a new feature designed to make it easier to follow people you meet in real life How I Used Online Tools to Make Real Friends Online How I Used Online Tools to Make Real Friends Online Moved to a new city? Head online and find new friends that will help you transform your new location into your new home. Read More . 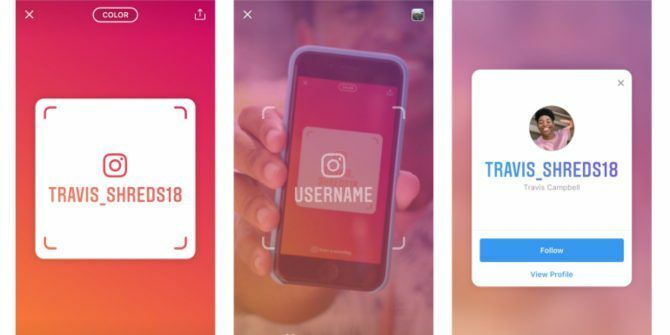 It’s called Nametag, and it allows everyone on Instagram to create a personalized name tag that’s unique to them. Yes, just like Snapchat’s Snapcodes. While Nametag makes it easier to follow someone on Instagram we’ve previously detailed how to remove Instagram followers How to Remove Followers on Instagram How to Remove Followers on Instagram It's obvious why private users might want to remove Instagram followers, but public accounts can also benefit. Read More . And given Instagram’s interest in school communities now also might be a good time to read the parent’s guide to Instagram Instagram Launches a Parent's Guide to Instagram Instagram Launches a Parent's Guide to Instagram A Parent's Guide is Instagram reaching out to parents wondering whether social media apps are a bad influence on teenagers. Read More .